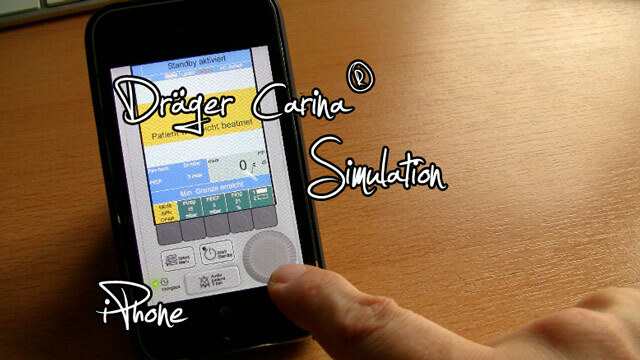 At innovation mecom, where I’m employed, we developed a simulation for training and marketing of a Dräger NIV ventilator called Carina®. It’s a small handy device to ventilate patients in hospitals. This Flash AS3 simulation reproduces all functions of the real device. So it is possible to get a real good impression of it even without using a real device. UPDATE: The iPhone Version is online. The online version of this trainer can be found here. I did the coding of this simulation and I thought it would be an amazing experience to use this on an iPhone or another touch device. But there is no flash on Apples iDevices. So, the first time I heard about that Adobe will integrate an iPhone packager in his Flash CS5 version I was very happy and curious about it. I couldn’t wait for that version to try it. But then, short time before the CS5 release, Steve Jobs changed his terms and conditions. He integrated only one sentence which made me sad again. Because of that sentence it is not allowed to submit apps to the app store not developed with Xcode. But Adobe released the iPhone packager anyway and I was able to do some tests with it even if I never will submit a Flash App to the Apple Store. But Adobe was not sleeping. They did an alliance with all other mobile device manufactures. They call it the Open Screen Project. And the first result is the Flash Player 10.1 for Android 2.2 devices. So in the near future many Android and Flash enabled touch devices will come to the market. And here is the result of my first studies with the iPhone and Android packager. I just had to reposition some buttons because of the smaller resolution and packaged it with the iPhone packager in Flash CS5. This worked great and the result was amazingly good. Next thing was to try it on Android. I registered for the developer beta program at adobe and tried the android packager for CS5. This works also very fine. Unfortunately I didn’t own an Android device so I had to use the virtual simulator which is really slow on my notebook. But the main thing is, that it works also without any bigger adaptions. And last week I got an iPad. And needless to say, I tried the carina app there too. It’s just a scaled iPhone version but the feeling of using it is really really good. I think it is not possible to get it nearer to a real ventilation device. Here is a short video of the results trying publishing Flash on multiple devices (Browser, iPhone, iPad and the Android Simulator). So I’m really curious about what Adobe does next. They announced an Android tablet with Flash Player and AIR. And then we get so much new and amazing possibilities using multitouch devices for simulating medical devices for training. That’s a good idea to bring the Carina Trainer to Android. Please make this suggestion direct to Dräger? I’m not in the position to decide develop and release a full Android version of the Carina Trainer. This must be done by Dräger. If I may make a request please? As some who who teachs a lot on ventilator devices (in particular the Carina!) what would be extremly useful for me would be an android version of this app. Similary The Dragear training simulators (downloadable from their site) converted to run on android would be even better! If I may make a request please? As some who who teachs a lot on ventilator devices (in particualr the Carina!) what would be extremly useful for me would be an android version of this app. Similary The Dragear training simulators (downloadable from theire site) converted to run on andoroid would be even better! I’m drawing the calculated of the curves directly to a Bitmap(). Hope this helps. Looks like a very nice job! I used to make simulations for medical devices (now I do device simulations in a bunch of other industries, for marketing and training), just haven’t had a good opportunity lately. Did you use the Flash drawing API for the waveforms? I’m always interested in hearing an approach for that, if you don’t mind sharing the overall concepts of your scrolling waveforms.